Stop writing BIG checks for IT that doesn’t work great! Move your applications, files, and desktops to the cloud and focus on your company’s growth. Pick up any device, securely login, and get to work. That’s the TOSS Cloud. 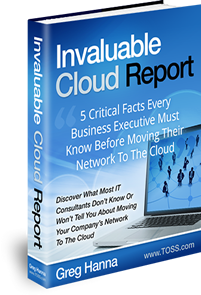 Learn the 5 facts every business executive must know before moving to the cloud. Discover what most IT providers don’t know or won’t tell you about moving your company to the cloud. Fill our the form below to receive yours. Keep your company available and employees productive, around the clock. Do real work, anytime no matter where you are or what computer, laptop, tablet, or mobile device is at hand. Get an average savings of 31% off your current annual IT spend. Attract more talent. Work happens wherever you are. Be in regulatory compliance. IT just works. Add employees and applications on the fly. Industrial-grade remote access included. Ensure your data is secure, encrypted, and always available. Make your business disaster proof. Get increased agility and flexibility while reducing time to market on new initiatives. Outpace your competition and be known as the forward looking thought leader in your marketplace.